I really like this drawing. I like the idea and the realisation is done successfully. I'm really impressed by the colors! Especially the grass looks very soft, just like the clouds. What I especially like is the background. The reflection in the water is amazing! I also love the volcano. It is clearly visible that the scene takes place in the Great Valley. Maybe the background would have been more decorated. Notably the area between Cera and the mountains looks a bit empty. But that is not essential, much more important is the foreground, and that is really well done! I think I like Spike the best. But I also like the other characters! Thank you! Yeah I better get on voting now haha. Man everyone loves Spike, it's great. Normally I'm not too fond of drawing him, but it worked out really well for this one. Glad everyone like how he turned out. Yeah it's hard deciding how much background detail to put in as it sharply increases the completion time, at least for me. I'm always so indecisive on what I should put in haha. I was going to have a pile of treestars a little behind Cera and Littlefoot that is partially blowing away due to them running away but I was taking long enough on it so I scrapped the idea. So approximately 369 days ago I did a drawing for the prompt: Draw a scene from a future LBT movie in which I drew a scene depicting Chomper's first encounter with Red Claw in response to several of Sneak's questions posted in my Ask Me topic. So when I first thought of suggesting a movie poster for the prompt I had the idea of taking a format of something like Star Wars and applying it to LBT, because sure why not? As soon as I thought to use my "LBT 15" the layout came to mind fairly quickly. Have the villain at the top looking imposing and all that and throw the main character in the center. Since this story would be all about Chomper trying to defeat Red Claw as a continuation of the TV series "plot". I thought it would be neat to make them have eye contact as it would naturally create an idea of Red Claw looking down as if superior and Chomper looking up to this seemingly insurmountable task. Wait...what is Ali doing here!? Well two reasons. First, I'm a fan of symmetry ok? Secondly, every great movie has romance doesn't it? Don't worry it will somehow all make sense in the movie! Seems like Littlefoot is distressed about something. What could it be? Maybe a death in the family? I actually don't know haha Seems like Ali is quite worried about him though. Will she be able to help Littlefoot out? There was a few other things that I thought about adding in but never had the room and/or the time. Things like some vague hype filled text as well as those lists of director, producer, screenwriter, and other stuff no one really reads. Also some sort of color background would've been nice. Anyways, hope you guys like it because I'm sure Universal will be green-lighting it soon! [EDIT]Image looks a lot brighter now! Thanks for pointing that out Ducky! Seems like the gang is in big trouble in this movie! It'd actually be nice to have an LBT movie that is a bit darker and more filled with tension, much like the original. Now I'm not very familiar with Red Claw as he was a TV series exclusive, but it seems like he could be a decent villain. Definitely one to mark his territory. I think the characters are all wonderfully drawn (though I've never been a big fan of the brown color scheme for Littlefoot personally ), and you've done a great job on the lettering too! Nice job getting the gradient in there. Will have to look at the drawing from a computer, phone doesn't do justice so I can't give a good review of the drawing. Poor Petrie, to be dumped like this... In all seriousness, this is simply a great drawing! The layout works in a really great way and it has a nice look to it. All of the characters' expressions are spot-on, especially those of Littlefoot and Chomper. The action scenes may not look as impressive as the rest of the picture but they do their job. My only problem here is that the title looks a bit awkward and the film should perhaps have had a unique name. But other than that, amazing work! Okay, now that I've got to get a good look at it, here are my detailed thoughts. It is really exciting that you drew a poster of a future movie! I can really imagine this story as a film and the poster fits! What I especially like, is, that one can think a lot about the poster. One can interpret many things into it, as you have actually already done. Why is Littlefoot thinking? Why is Ali worried? Many open questions, which cause one thing: Advertising. This is the third point which I like. I think, the advertising effect of a poster is really important. If I saw this poster, I'd most likely watch the movie! This prompt was a blast to draw, even if drawing all the side characters ate up all my time. 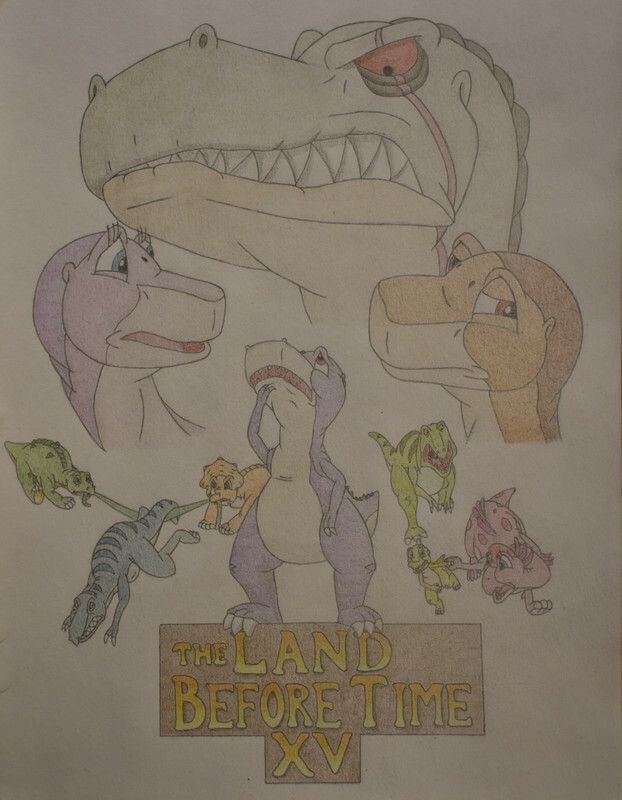 I had Red Claw, Ali, Littlefoot, and Chomper done in one nightm with the title finished a couple days later. The rest took over a month of me being lazy/trying to figure out how to plan and draw the poses so they don't look like crap haha. Hope it was worth the wait! 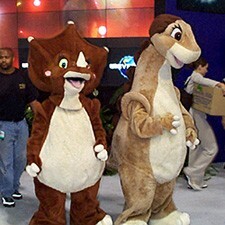 I've talked to you about it before and I agree with you on the brown color for Littlefoot as well. I've spent a good amount of time trying to get Littlefoot to look right with colored pencils but it doesn't seem to work, especially in this case as I wanted him clearly differentiated from Ali. Glad you liked it and the title too! As you may know I struggled to try and get it lined up and centered properly haha. Managed in the end and I am quite happy with the gradient as well! Yeah a proper title would be ideal but that would of probably added an extra year for me Seriously I'm really bad with coming up with names. It would end up being something dumb like "Chomper Tries to Rally the Great Valley but Fails, but Wait, he Actually Does in the End and the Power of Friendship Beats Red Claw"
Well I'm glad you've taken a liking to the potential of the idea! We'll see what happens down the road. I've re-uploaded the image with it brighter, thanks for mentioning that! I was really happy with how Red Claw turned out as well. Probably my favorite part of the drawing. Ali was a surprise for me as well. I knew I wanted Littlefoot up there as a floating head and after Red Claw was drawn and Chomper was planned out in my head there were 2 spots so Ali popped in my head to mirror Littlefoot. Looks like I've succeeded in my job then! Yeah I agree. For Chomper and Red Claw I wanted it to be fairly obvious what is going on with the 2 given the knowledge of the TV series. With Ali and Littlefoot that little bit of mystery opens it up to different possibilities. It's the reason I decided on non happy faces as that is harder to read into and theorize and becomes more generic. Good to see you'd want to watch my movie! Thanks DarkWolf! Yeah all the small drawn characters were difficult to include, the 4 big ones were actually not that bad! I'm glad you like the title as well since I spent I good amount of time trying to make it look as legit as possible haha.